Insulinoma is the most common functioning tumor of the pancreas, and affected patients present a tableau of symptoms referable to hypoglycemia (symptoms of catecholamine release), mental confusion and obtundation. Many patients have symptoms for years. Some have been greatly troubled by emotional instability and fits of rage, often followed by somnolence. Incidence: This tumors are so rare. Probably the best series of insulinomas is from the Olmsted County (Mayo Clinic). This study (cohort) was seen over a sixth decade period (’27 to ’86). The incidence there was 0.4 per 100,000 person-years (or four cases per million per year). The diagnostic hallmark of the syndrome is the so-called Whipple triad, wich consists in symptoms of hypoglycemia (catecholamine release), low blood glucose level (40 to 50 mg/dL), and relief of symptoms after intravenous administration of glucose. The triad is not entirely diagnostic, because it may be emulated by factitious administration of hypoglycemic agents, by rare soft tissue tumors, or occasionally by reactive hypoglycemia. The clinical syndrome of hyperinsulinism may follow one of two patterns or sometimes a combination of both. The symptom complex may be due to autonomic nervous overactivity, expressed by fatigue, weakness, fearfulness, hunger, tremor, sweating, and tachycardia, or alternatively, a central nervous system disturbance with apathy (or irritability or anxiety), confusion, excitement, loss of orientation, blurring of vision, delirium, stupor, coma, or convulsions. Because cerebral tissue metabolize only glucose, prolonged profound hypoglycemia may cause permanent brain damage. Clinicians need to be alert to this when attempting to induce hypoglycemia by fasting. Preoperative NPO orders must be accompanied by intravenous administration of glucose. The diagnosis: Is established by demonstrating inappropriately high serum insulin concentrations during a spontaneous or induced episode of hypoglycemia. Then imaging techniques are used to localize the tumor. The available procedures include spiral CT, arteriography, ultrasonography (transabdominal and endoscopic), and 111-In-pentetreotide imaging. Transabdominal ultrasonography is our preferred initial test. Insulinomas are small (usually smaller than 1.5 cm), usually single (only 10% are multiple and those are usually associated with MEN 1 syndrome), usually benign (only 5% to 10% are malignant), and usually hard to find. Success in localization often parallels the degree of invasiveness of the study. Treatment for insulinoma is surgical. At operation, the incision is dictated by operator preference, either a midline incision from the xiphoid to below the umbilicus or a bilateral subcostal incision. Exposure should be generous, and mechanical ring retractors are an asset. 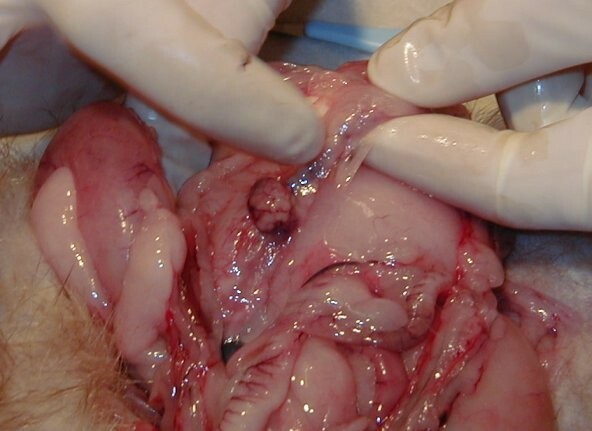 The entire abdomen should be explored, with particular attention being paid to possible liver metastases. The head of the pancreas should be palpated carefully and examined anteriorly and posteriorly; the body and tail of the pancreas should be palpated, dividing any ligamentous attachments to the spleen, delivering the spleen into the wound, and rotating the tail anteriorly to allow palpation and visualization. Anyone operating patients with pancreatic islet adenomas should be familiar with techniques for, and limitations of, intraoperative ultrasonography. The higher-resolution (7.5-to 10-MHz) transducers are used in the pancreas; because of its greater depth of penetration. Islet tumors are detected as sonolucent masses, usually of uniform consistency. Several reports attest to the high degree of accuracy of intraoperative ultrasound. Review of current literature leads to the almost startling conclusion that nearly all syndromes of hyperinsulinism are due to insulinomas and that nearly all insulinomas can now be detected before or during surgery. Having said this, there appears to be scant justification for an empirical (â€œblindâ€) partial pancreatectomy except in patients with insulinoma plus MEN 1. Most insulinomas are benign and can be enucleated. Nutrient vessels in the bed of the adenoma should be cauterized. The 10% of patients with hyperinsulinism who have MEN 1 syndrome have multiple islet tumors, one of which is usually dominant and responsible for the excessive insulin output. Steve, I live in Louisiana. You know someone with experience within the LSU system? I went to a university medical system in Houston. I did have the 72 hour fast, which is the standard test for insulinoma, but I passed it. But, I think I may be a person that has either a co-existing endocrine problem that may be messing with the results(I have a small tumor of each adrenal gland) or I may be one of those 6% people. I am a malignanat Insulinoma patient who has gone through a whipple back in 2008. insulinoma is very rare, and many doctors do not ever see one in durring their practice. I would seriously consider looking to see a doctor who specializes in Islet cell tumors. (such as Insulinoma, gastrinoma etc.) Usually, the major university hospitals have the most experience with this, but the fact that your blood sugar is dropping into the 40s is not healthy. (as you already know 🙂 ) It may or may not be insulinoma, but either way, its best to get the answers from someone who has a lot of experience with these types of situations. Where abouts do you live? I went to the University of Iowa and saw Dr. O’Dorisio, but i know there are many other great centers out there. Hopkins is good, Mayo is good, UCLA, and LSU are the few that come to mind. Good luck!!! I did ask my endo about the monitor and she said no, it wasn’t accurate. So, that was the end of that. She has told me to just not eat anything “carby”, and to eat often. To me that is ignoring what the problem could be. It is not normal for someone to be like this for so many years! The only reason I went to her almost two years ago was because it was getting harder to control. I feel like no one is taking this seriously. I think they think if I add 2 tsps. of sugar to my big glass of tea that of course I’m going to get blood glucose down into the 40s! That doesn’t make sense!! Every person I know lives on so much more sugar or carb than I do and they don’t get hypoglycemic. And, there is that publishing by Mayo that did state that 6% of insulinoma patients only showed signs/symptoms when exposed to sugar…. Ask your doctor about the iPro. It is a small meter that they insert into your stomach to get continuous glucose readings without you testing yourself, that way it is getting readings while you are sleeping. I think it is typically worn for three days and during that time you need to keep a very precise log of your eating/drinking and times. That way once they remove the iPro and hook it up to a computer, they can try to match your readings with your food log and see if there is any correlation. I’m not sure how much they actually rely on that information for anything but it can’t hurt and may help your doctor narrow down what the problem might be. What does your doctor think at this point after the various things you have done? Robin, in my 72-hour fast, I only dropped to 60(?). But, at home recently, I got up at 5 am and checked my glucose and it was 52. So, I know I apparently go “hypo” while I sleep. It is so weird, most of my early morning dreams(like around 4-7 am) are my most vivid, and ALOT of the time I am trying to find something to eat!! That’s what got me to asking my endo a few months back if there was any way to where a continuous glucose monitor to see if I drop and then come back up while I sleep. And, I know I do that. She said no. At 3 hours I had no symptoms. At 3 1/2 hours I was anxious, sweaty, heart racing, irritable, so I told the lab tech I needed sugar. She called the doctor and he said when my glucose had been at 52 half an hour earlier, i should have been given glucose. I got juice right away. The only thing is they did not draw that last blood when I was having symptoms. I know that it had to be in the 40s, but don’t know what the insulin was. Of course, all the levels in literature are based on fasting glucose and insulin levels. So, I don’t know if the glucose tolerance test higher insulin level means anything. I just know that I am not diabetic, but I can’t eat anything sugary without my insulin going soooo high that my glucose crashes about 3 hours later(into the 40s). I have been doing this for almost 20 years. This can’t be normal!!! I wonder what would be a good test or whatever to ask my endo to keep trying to find why I have so much insulin? I was able to go thru some of my paperwork and found that in all of the fasting bloodwork that was done, I had glucose levels in the 30-40’s range with elevated C-peptide and insulin and proinsulin levels (3.0 insulin/17.9 proinsulin). You probably already know but when your glucose levels are that low, the insulin/proinsulin levels should be nearly nonexistent. Have they run numorous fasting bloodwork on you and do you see an endocrinologist regularly? You have to push for them to try to figure it out because my doctor was having the hardest time with my case and kept my file with her at all times and anytime she would go to a meeting/conference she would consult with other dr.’s to get opinions/input. When she would ask her colleagues for input, they would just blow it off and say “just treat her and have her eat more often”. If it weren’t for her, I may still be sick and going thru it all. She is the one that finally contacted the Mayo Clinic and asked if she could send my file and they review it to give input and they are the one’s that suggested it might be Insulinoma. That’s when we started doing all of the CT Scans, MRI, ultrasounds, etc. but like I’ve said, nothing was found. How severe do your symptoms get and how long does it take for your sugar levels to drop after eating? Do you know if they’ve checked for proinsulin levels in your past bloodwork that was done? Hi April, was Dr. Thompson your surgeon? My experience there was wonderful and I am so thankful for all of the great doctors there that helped me! Glad to know that some mild pain is common; maybe the pain that I have is normal. The incision itself looks great it’s just the internal pain down below my belly button that bothers me. Sue (T)- I am so happy that you are on your way to being healed! I’m about 5 months out now and feel back to normal for the most part but even a month after surgery was tough. This surgery is definitely hard on the body. You sound like you are doing great for such a recent surgery date. Fortunately i was only in the hospital for 6 days after surgery and they removed my drain before I left the hospital so I didn’t have to use the drain long. Glad that you are doing so well so quickly and have no more symptoms! Wow another Dallasite with the same illness experience! How long did your deal with it before your diagnosis? Who was your doctor here and did you have your surgery in Dallas? I don’t have any back pain just some stomach pain. I tried to throw the baseball with my son the other day and it felt like my stomach was going to rip open! Wonder how long it will take for that to go away? Reading all of the posts here and going through all of my labwork/tests that were done over the last couple years just reminds me how awful it was and how thankful I am to feel like I have my life back. I pray that all who are seeking the same will find it! Does any know I doctor in Fort Lauderdale Florida. My symtoms are getting worst, did all the test, but have not foud a doctor or surgeon who can treat me. in June it will be three years since my isulinoma was successfully removed. My story is very similar to yours and i too live in Dallas Texas. I hope to hear more of your story…. and so happy to hear your surgery was a success!! Sue (T)–thanks for answering my question back on 3/28!! For some reason, I don’t get notified of all the new posts, just some, so I miss things. This one of the other Sue’s, surgery date 3/3/11 . Robin, I am so glad your insulinoma was found and all is well now. I am a month post op and feel great , I had a JP drain draining fluid and the surgeon removed that this week as the drain was almost on it’s way ou on it’s own. I was still draining more fluid then he’d like but it is clear and no infections or anything showing on ultrasound. removing thr drain didn’t hurt , I felt discomfort later that day but feel almost normal now except I am still draining . It has slowed but I am still changing bandages over the drain site many times a day. I am hoping it slows and stops draining soon! If anyone has had a similar experiance I would like to hear about it. Mayo Clinic found and removed my tumor as well. And it sounds like we had a similiar experience there. I did have mild pain for quite a while after my surgery, though not enough to require pain medicine after the first month. I am over two years past surgery and still have a lot of numbness at the incision and very occasionally mild pain in one area. It takes a really long time. i have my regular doctor look at the incision whenever I go and that reassures me that it is healing fine. It is hard to look up anything here because it is one looooong post-like forum! I’ve had bouts of low blood sugar for 20 years. I didn’t measure anything back then, I just knew I got shaky and anxious, and if I ate, it promptly went away. It didn’t happen everyday, but still I ate fairly regularly. Two years ago I bought a meter and found out I was getting into the 40s and 50s when I got shaky. It was to the point that I had to eat every two hours to prevent it. I was okay at night, but off/on waking with heart racing and/or light sweating. I passed the 72-hour fast, so doctor dropped it. I have read that a small percent of insulinoma people react ONLY to glucose. So, that’s where I stand–with daily symptoms and no diagnosis. I was trying to look through the past posts to find your history/story but it’s kind of confusing because there are different people named Sue! I guess what I meant was it something that would happen out of the blue maybe every couple of days or daily, every day. I passed my 72-hour fasting test, but if I eat anything with a little sugar, I drop within 3 hours to around 50s or 40s, so I eat something. It has been really bad the last couple of years, so I just eat all the time. But, I don’t eat at night. I did get up real early one morning to test(like around 5 am) and it was something like 52. I wake up off/on all night with sweats, etc. so figure my blood sugar drops and brings itself back up. Yes I believe the proinsulin did have something to do with helping them with the diagnosis although I’ll have to look at all my test results to see what those levels were. Once all this started and we started monitoring my blood sugar levels, my typical daily blood glucose levels were about 35-50 even within two hours of eating. I used my glucose monitor about 4-6 times per day. What were you referring to when you asked “if this happens daily”? Yes I would be happy to share that information with you. I will have to look through my paperwork at home and find those numbers for you. My very first episode was on the trip I mentioned and that was March 2008, so I guess I dealt with it for a little over 2 1/2 years before the recent surgery. Although not as long as many others experiences, it felt like a lifetime! Sorry, I see you posted the first part of your story. So, did this happen daily? So, it was the proinsulin that helped make the diagnosis? What was your insulin levels like? Thanks for your story! Wow, it sounds like it was quite an adventure to find the little tumor. I am a stickler for numbers–would you mind sharing what your glucose numbers were like before diagnosis? How many years have you been going through low blood sugar episodes? Correction: * I became pregnant in December 2009. I apologize that the post is long winded but as all of you know from experience it has been quite the journey and I don’t want to leave anything out that might be helpful to somebody going down this same path. To make an already long story longer =] it all progressed really quickly and once Insulinoma was suspected, my doctor scheduled me for an MRI, which found nothing then we did an endoscopic ultrasound and that was unsuccessful as well. We were back at square one with no answers and not sure where to go because from the symptoms, my doctors were convinced that it had to be Insulinoma but nothing could be found to guarantee that diagnosis. I became pregnant in December 2010 so our investigating was put on hold and the doctor that performed the endoscopic ultrasound said maybe the tumor was too small to be detected and needed time to grow. During pregnancy my hypoglycemic symptoms improved greatly and I no longer had to set an alarm to eat during the night, etc. This was expected because my Endo said during pregnancy the placenta produces more natural sugar in your body (which is why many women get gestational diabetes) but said the symptoms might come back even worse after I deliver. Boy was she right! It was horrible, I even had spells where I would be completely awake but wasnâ€™t really there and then had no recollection of the last few hours once asked about it. I didnâ€™t remember where I went or conversations I had-it was very scary! It become normal that I would go into a comatose type state if I didnâ€™t get up during the night every 2-3 hours to drink orange juice and eat something (normally peanut butter crackers) so we had a Glucagon injection kit on hand at all times in case my husband could not wake me up. I couldnâ€™t be left alone to care for my newborn so someone would have to come stay with me during the day so that I didnâ€™t present a danger. Since I had delivered the baby we could now begin all of the imaging tests again and we did everything-MRI, Octreotide scans, numerous endoscopic ultrasounds, etc. and the doctors still didnâ€™t see anything. They were completely convinced that it was Insulinoma based on the severity of my symptoms so they referred me to the Mayo Clinic in Rochester, MN. What a blessing! This was this past November 2010. It took about a week to go thru all the testing and imaging, which I might add they still did not see anything conclusively to show where the tumor was located. They did the calcium stimulation test and did see that the middle and tail of the pancreas were more reactive. They decided to do exploratory surgery on November 14, 2010 and they found the tumor!!! They removed it and 10% of the pancreas. I am about 5 months post surgery and I haven’t had any more symptoms! It has been a slow recovery but I haven’t had any complications. I still have some pain in my incision below my belly button which I’m wondering if this is normal? I haven’t started exercising again yet because of this pain but hope to be able to fairly soon. My surgeon said it would probably take about 6 months before I would feel back to normal. Has anyone else had this pain post surgery? I’m wondering if I hurt something internally from picking up the baby, carrying around the baby in a carseat (which can be very heavy) or if this is normal for everyone? I truly feel blessed to have gone to the Mayo Clinic because they are amazing and although it was a long way to go (I live in Dallas, TX), they are experts with Insulinoma and have seen so many cases from people around the world. I would highly recommend going there if you are having a problem finding someone in your area who is experienced with this illness. My best wishes go out to all of you that are going thru this same journey and those that are seeking answers. The brightside is that in most cases, it is a cureable illness and you can have your life back! God bless. Wow, I don’t know how I missed this sight when I was doing all of my research over the last few years. So thankful to see that so many are sharing their stories and experiences because it can’t be more frustrating to be searching endlessly for a diagnosis and not get it. I became sick a little over 2 years ago and it all happened so suddenly and out of nowhere. I had no previous health conditions and wasn’t a person that ever got sick. I want to share how it started for me in case anyone else is experiencing something similar and wondering why. Many posts on here sound like it was a gradual process so wanted to show also that it can come on suddenly and symptoms can be severe rather quickly. I happened to be out of town on a girlâ€™s trip one weekend and there was one day that my friends couldn’t wake me up. Not that I was comatose or passed out but they said it seemed like it was a really bad hangover and I just seemed out of it and wasnâ€™t making sense when they were talking to me. We had been at a big pool party the day/evening before and they thought maybe I had too much to drink or maybe that someone had slipped something in my drink at some point (scary as that may be and I only had a few cocktails the entire day). I stayed in bed at the hotel the entire day and they said that when I would talk to them that I just didnâ€™t seem right and didnâ€™t make any sense. That was that and we returned home to Texas the following day. A month or two went by and I started to have this strange numbing/tingling that would happen in my face (mostly around my mouth) and my hands. I noticed that when I would eat something it would help the sensation go away. When I went for my annual wellness visit with my ob/gyn I mentioned this to her and she suggested I go see an endocrinologist. This was mid 2008. The Endo had me start tracking my eating and using a glucose monitor because they thought maybe I was turning diabetic. She determined it wasnâ€™t the onset of diabetes and we did lots of bloodtests and the symptoms started getting worse and worse similar to what people described here (confusion, blurry vision, hard time waking up, night sweats). I am the Sue who most recently had surgery, added T to my name to show which Sue is which. Heidi, I have read all posts and read all your posts about your husbands insulinoma journey. He has had a long recovery , my 7 in scar where the surgeon reached in and ttook the insulinoma has healed and is not bothering me but with the drain still in(can’t imagine 3 drains) it is sensitive and was sore for days after last weeks ulrasound to see where my drainage is coming from, the ultrasound gel stng and the probing of the area caused soreness for days. I hope once my drain is out that it heals as well as the surgical scar, we shall see. To Sue: to answer your questions You were colder or hotter than your previously normal self? I also have Reynauds and my hands and feet tend to be cold , fingers especially , really noticed it while in the hosp more than ever before. 2. Did you notice that you were lightheaded when upright? Yes often when standing I have to wait a bit before walking , blood pressure must drop. ,it didn’t happen all the time but more than say my husband , who it never happens to. 3. Did your muscles feel like noodles some of the time? no I don’t think so, I also have been working out with weights for over 10 yrs and at various times would see vasodilation of veins in my arms and hands especially whn warm but thought it had to co with my high protein diet and weight training if anything. Oh and since surgery 3 weeks and I have lost 9 lbs and some is definatly muscle, I have always been thin but now the triceps “flap” where they never did. My hubby, Mike, was just commenting to me the other day that there is one section of his scar that is still numb, although the rest has recovered feeling. His scar is shaped like a hockey stick and the numb area is where the line bends. The straight parts have feeling now. His surgery was March 17, 2009. Unfortunately he has developed psoriasis on his body in the last year, and that attacks his scar regularly and he has to use a strong steroid cream on his body. He also had 3 drain tubes over the months during and after his surgery and those scars are also sensitive. 1. You were colder or hotter than your previously normal self? 2. Did you notice that you were lightheaded when upright? 3. Did your muscles feel like noodles some of the time? I ask these questions because I’ve been reading research that states that hyperinsulinemia causes vasodilation, which I think could contribute to all three questions. I have a 20 year history of low blood sugar, but more importantly, I have a 5 year history of lightheadedness when standing. It’s like my body can’t control my blood vessels anymore. All day and night, I get these random flashes where the normally non-existant vessels in my hands just stand out all over, even on my fingers! My hands turn bright red and get so hot. That’s what made me end up finding this research, and I thought who better to ask than people who have a history of hyperinsulinemia! Thanks. Thanks, Tatia. I appreciate your story and your support. My name is Tatia and I too have been on this forum for over 2 yrs. I was finally diagnosed in Oct of 2008 an had my insulinoma removed in Dec of 2008. I had symptoms for at least a year before and the last 6 months I nearly went into a diabetic coma daily if I did not eat every 2 hrs, including during the night. I had to set an alarm 3 times during the night to wake up to eat. Needless to say it was a difficult time. I understand the frustration on having this illness and finding treatment. Doctors do not have experience with this and you have to be your own advocate. I had my insulinoma diagnosed and finally found at Barnes Jewish Hospital in St Louis, Missouri. I would be happy to share my full story with you and my doctors there who I still see once a year. If you check back on the forum from about Jan 2008 to Summer 2009 you will see my entries along with many others. I think this site has had some hiccups the past few months and so many entries have not gotten on . Please let me know if you would like more info about my doctors. “Among the 214 patients who provided a reliable history, symptoms of hypoglycemia were reported to occur exclusively in the fasting state (F) in 157 (73%), postprandial state (PC) in 13 (6%), and both fasting and postprandial state (PC+F) in 44 (21%) . I just wanted to show that 6% of their insulinoma patients only showed hypoglycemia in the postprandial phase. And to complicate that even further, only 3 out of those 8 had negative 72-hour tests. Someone like me could be that very minority! That’s why I think people with chronic cases of “reactive hypoglycemia” should be taken more seriously by the doctors. I am going to continue to pursue this with my doctor, and even sending a copy of this article to him. This question is for those of you who are post surgeries. How long does it take before your incision is completely healed. I am two years past surgery but I continue to have numbness and some itching around the incision. Very rarely is there any pain and then just a little, but I had hoped to not even be able to feel it by now. Just wondering about any other experiences. Sue, When I was going through diagnosis, there were some studies going on at the National Institute of Health in Washington, DC. If you qualified, you could go there and get diagnosis. You can look them up on the internet to see what clinical trials are going on. I ended up going to Mayo Clinic which was far away, but only took a little over a week to get a firm diagnosis and location. Sue, I have a great doctor here in Chicago, and I know they are great at Mayo in MN and at Johns Hopkins in MD, but I know no one in the south. Let me know if you would like any of thee names. I agree, I have not known someone with an insulinoma to not drop during a 72 hour test. Most of our tests were significantly shorter due to not eating the morning of test. Mine was 2 hours for example before my blood meter was reading “lo”. I have had two 72-hour fasts. The first one lasted about 50 hours, at which point my blood sugar was about 1.7 mmol/L. It had actually been 2.2 the first day, but they used a limit of 2.0 (some terminate the test at 2.5). 2.0mmol/L is 36mg/dL and 2.5mmol/L is 45mg/dL, btw. The second fast only lasted 4 hours (I hadn’t eaten since the night before), and my blood sugar was 2.0. The blood work was pretty straightforward for the trained eye, which means some doctors were in doubt, and experienced ones were certain. This is complicated stuff, however, and apart from insulinomas there is reactive hypoglycemia, noninsulinoma pancreatogenous hypoglycemia syndrome (NIPHS) and probably several other conditions. So I guess it’s all about finding the most qualified doctor to test you. Where do you live? Regarding insulinomas, I think it is extremely unlikely that an “insulinomiac” could go through a 72-hour fast with normal blood sugar and insulin levels. It must be very frustrating and I hope you figure things out. Sorry, Sue, I just saw your story. And Nicolai, I don’t think I found your story. Does anyone know of a specialist in the US regarding possible insulinomas? Hopefully in the South somewhere, as I don’t travel well. Okay, Sue and Nicolai, I ask these questions because I am in a quandry!! I really appreciated these stories!! I have been posting on this forum for a couple of years trying to get good info to “build” my case for the doctors. The reason I asked the previous question is because I can make it through the night, but once I begin eating in the morning, I HAVE to eat every 1 1/2 – 2 hours or my blood sugar drops. I can’t eat anything sugary or my body overreacts. That can’t be normal! The doctors tried to say it was insulin resistance, but I dropped 20% of my body weight and no change. Actually, this all started 20 years ago and I was a perfect weight then!! It has gotten progressively worse in the last few years. I did the 72-hour fast a year ago, but didn’t drop. I only react to carbs and sugar, but then I REALLY overreact. So, how did each of you get diagnosed? Did you pass a 72-hour test? I hate to ask if you already posted, but this forum is the most difficult forum I have ever been on because it isn’t set up to look up posts by author, etc. My experience has been fairly similar. I have thankfully never had problems while sleeping or in the mornings. Normally, I will get into trouble later in the days, especially if I had done sports (which I don’t any more) or have forgotten to eat enough. I almost always sense the symptoms before co-workers and quickly get something to eat or drink. Only my wife is better at it than me, and often asks me to check my sugar – and usually she is right that it is low. Pretty scary actually, that this conditions affects your mental state in that way. Good luck with the recovery Sue, and to everyone else. Hi this is a different Sue , Nicolai I had my surgery on 3/3 and it is so freeing not to have to think I Have to eat, now it is I want to eat.. I didn’t have problems with hypo at night and not when waking . My problems where later in the day usually and most times I wasn’t aware when it dropped and basically scared family members and coworkers. I am so glas I am in the recovery period now and low blood sugars are behind me. Good luck with you surgery and we all look forward to hearing from you when you can after. Glad your surgery is coming soon, and you can finally NOT eat if you chose to!! Can I ask, do you make it through the night without eating? Is your glucose really low when you wake up? Just wanted to tell you that now, two and half years after being diagnosed, I am only two weeks away from surgery. It has been a long and bumpy road to find the tumour and then decide where to get the surgery. Eventually, I decided on Hammersmith in London. My tumour is on the head of the pancreas, 1.5 x 1.1 cm, and in a tricky location. The doctors in Denmark would actually only offer me an open Whipples operation, so that’s one reason I have spent so much time finding another place for treatment. The surgeons at Hammersmith will try laparoscopic enucleation, which they believe is possible. Even if they have to open me op, I am just really hoping I can avoid a Whipples. I am so ready to get this thing out of me and doctors at Hammersmith all seem very skilled, so I am happy to finally be done with the preparations. My symptoms have gradually been worsening, but generally I have been better off than most insulinomiacs. I do get an occasional 2.6 reading before dinner (when my wife tells me I seem very “strange”), but sticking to a lot of small meals helps me have fairly few problems. However, I would really like to live a more normal life – like being able to exercise and eat just 3 times a day without being afraid of collapsing somewhere. When I was first diagnosed I spent a lot of time researching, and found a lot of information that even my doctors did not seem to know. It seems a lot more information has popped up over the past year or so, but clearly this a rare condition and not easy to get treated for. I am actually hoping to set up a website, which would explain the disease and also very practically how to get treated. I will let you know how it goes with my surgery, and also with the website. Hi Sue, I am doing well. I had surgery a week ago and instead of laprascope the surgeon used a 7 in incision and by hand located the insulinoms, he told me once I was open it was right in front of him. He was able to enucleate it even it is was 2 cm and so all went well. I was released from the osp with a drain and went home Sunday. I am swollen and my middle doesnt feel it belongs to me. The gas(from both ends )is getting better. This morning I slept the best I have so far and my abdomen is swollen but softer and that feels good. I see the surgeon 3/23 for follow up and want to hear more about his reason for noe even attempting the laporascope. I know he did everything the right way I am just curious. The surgrey took 4 hrs and as my hosp is a teaching hosp I had many residents daily visiting me, was kind of enjoyable since who knows howmany will actually see an insulinoma case. Oh and I am taking ibuprofin and acetiminifen and no pain meds now and that may account for my feeling better also. Sue, wondering how your surgery went. Hope you are doing well! I am fortunate as my endocrinologist refered me to a pancreatic surgeon who is one of the top 10 in the city and he is very thorough so we shall see how it goes. I had a hysterectomy many yrs ago and from what I have read here(all the posts!) I know thie recovery will be no walk in the park. But I am glad to have others experiances to draw upon when looking at my recovery, I am not alone. I will post when able after my surgery on 3/3. Wow, this is awesome reading all your stories and very exciting. It sounds like a very uplifting message board. As for me, I was actually diagnosed with Nesidioblastosis (or hyperinsulinemic hypoglycemia) when I was about 8 or 9. I lived in NY and was diagnosed at Mt. Sinai Hospital. I was on diazoxide (proglycem) until about age 13 when I outgrew the symptoms. My doctor had told my parents I would, but that later in life, near the end of my child bearing years, it would re-appear. About a year and a half ago (when I was 30) I started complaining of blood sugar lows again. It was then that my mom mentioned that the doctor said this would re-appear. I started researching but put it aside when I got really sick and finally got diagnosed with Hashimotos Hypothyroidism. Recently, I went to an Endo that I really trusted and knew and she tested my insulin and put my back on proglycem. I was so excited that and thought I would be better in no time. A few weeks ago I went back to her to follow-up and said I was feeling better but not 100% After explaining my symptoms to her pre-medicine. Crazy low blood sugar drops. Inability to concentrate. A consistent haze and telling her that a few times I had to pull over because I couldn’t drive — she told me she wanted to test me for Insulinomas. My mom had told me that I was tested as a kid and that the doctors were hoping it was a tumor but that it was not. My endo said it was entirely possible that they missed it back then. My hunch is that it was pockets of islet cells back then but that it has developed into a tumor. Mostly because when I was a kid, exercising made me feel better — but now it can totally rock me. I was wondering a few things. Has anyone had an insulinoma but were told you have overproducing cells inside your pancreas as well? Has anyone gotten the tests and/or surgery done in Denver at Anchutz Medical Campus? I love my doctor but I do want to know how much experience they surgical team has? Do you get the intra-operative surgery immediately after the 72-hour fast? Or do you have to come back? I am not the most patient person and getting sicker by the day. I’m definitely inspired by all of your patience though. Thanks for all of your stories and advice. Much appreciated! Sue, don’t get your hopes up that your surgeon will be able to give you a definate plan before you have surgery. In every case I have heard about, they have to see it first to make a plan. The most important thing is to make sure your surgeon has a lot of experience with these types of surgeries. The insulinomas do not have to make you fat, it does happen very often due to the constant munching, but there are lots of other factors like your activity level and what you munch on that play into whether or not you get fat. My story is that @10 yrs ago I would all of a sudden need to eat and get shaky and sweaty..I figured it was hypo but during any dr appts was told just to eat frequently. About 3 years ago I started having episodes of hypo unawareness and it wasn’t until I was at work (I work at a school, with a school nurse thank goodness) that I went totally out of it in from of a classroom of students and the welness teacher. Blank stare mumbled responses, When it happens I know nothing. I “came back ” and I was laying on the floor and the nurse had checked my blood sugar(I had in the past felt low so she knew to check and it was in the 20’2) She was giving me frosting and then I was taken to her office and ate and drank juice. That was the only time I came back with a headache. Then as many have mentions reguarding seizures, a month later at home I had a full blown Tonic Clonic and was taken to the hosp. at the time it occured I was stressed and it was late morning and I was just getting breakfast(I usually eat @ 7 am. So underwent testing and no cause was discovered but the neurologist put me on Keppra\for seizures. Since then I eat small amounts often and dicovered no rhym or reason for the lows and after 4 episodes at school this past fall I went to a new physician who refered me to an endo who suspected insulinoma and in Dec had the 72 hr fast(lasted 15 hrs). and now I am off for enucleation , or possible distal panc and spleenectomy depending upon what the surgeon finds this coming thursday.. When the ct was looked at there was a tumor on the left adrenal and after blood tests that came back showing no hormonal activity , I also had my blood pressure checked , at work it was normal , at the surgeons it was high. I had an MRI this week as the surgeon wanted to get a better picture of the adrenal and the report says 2cm insulinoma within the pancreatic tail and a 1.5cm smoothly marginated adenoma with suspected intratumoral lipid. I will check with the surgeons office Monday to get an idea what he thinks he will plan to do in surgery,although I know everything is subject to change. I am unusual as far as the surgeon and endo think as I am very slim even with the constant munching(usually on healthy foods) and I am usually in constant motion , don’t like to sit still for long whichmakes me wonder about the adrenal gland and if that has played a part in that. I will ask about the possibility of it being a pheochromocytoma. I read that you had a strange reaction to the glucagon AND you have a growth on your adrenal gland. Did your testing recently show maybe a pheochromocytoma? To test for that tumor, one has a “glucagon stimulation” test. It causes the pheo to release catecholamines, and when someone is having a pheo episode, they can feel like vomiting. However, their b/p usually goes really high, but I guess it could come down and overshoot! Just curious what you found out. Did you post what your initial story was, with history of symptoms and how you progressed? I ask because I have a history of hypoglycemia, but also have a problem with what seems like adrenaline surges not necessarily related to low blood sugar. So, I wonder if I might have an occasional functioning pheo that in turn makes my glucose go normal, then drop too dramatically, then overcompensate and rise again. It seems like I am back and forth. I think something was wrong with this board for a while, since I hadn’t seen a single post since December 2010, and all of a sudden others have started showing up this last week. To those of you who are thought to be having seizures, I can tell you that the time before confirmation of insulinoma is very challenging. My hubby appeared to be having a stroke when I called the ambulance. The medics recognized it as a glucose problem right away, but assumed he had been taking diabetic meds, which he hadn’t. A common thread amongst posters here, has been the sense of confusion, exhaustion and losing control, which I think might be attributed to seizures. You are lucky if your doctors are trying to rule out insulinoma, since many, many medical people have never seen it or understand the subtle effects that are the first visible symptoms. If your initial testing shows insulinoma, the fun begins! The challenge is just finding these very small tumours, having a surgeon who has experience in this potentially complicated surgery and the luck of the draw in not getting post-surgical complications. It can be as simple as a laprascopic enucleation procedure, all the way to a full Whipple, which is very challenging. If you follow the comments on the board from earlier participants, you will see that the range of success and challenges is quite wide. The one thing everyone has said, is that the tumour has to come out if one is found. There really are no other options, but the process to find these tumours is almost the hardest part. It has been almost 2 years since my husband, Mike, had his surgery, and he spent a total of 7 weeks in hospital due to complications. However, besides the incredible scars on his belly, he is now well and functioning better than he had for the previous 5 years. I was very, very grateful to have the support of my fellow posters during our journey and hopefully those of you who are participating in this difficult challenge now, will be able to support each other. Take care and good luck. You will need to be your own advocate due to the rarity of this condition and you will need good family support to get you through the difficult days. Just testing to see if this board is still going. I see it’s been 4 months since a post! The odds are quite amazing on how many cases of Insulinoma are diagnosed in x amount of millions of patients which warms your heart, but when faced with it, it seems like it is a common thing. I’m Stew, 29, from the South of England. I had my first grand mal seizure last Easter in which I bit my tongue and showed signs of clonic tonic Epilepsy. I then had another seizure 6 months later which was more severe. In both cases, by blood glucose reading was taken by the paramedic on arrival to my house which read normal but on my arrival into hospital, my BG read 1.7! My amnesia and drowsiness dispersed once given Gluco tabs and the BG started to creep up again. I have since started taking Lamorogine. first 100mg, then I had a petit mal seizure and got stepped up to 200mg and now I am on 250mg after jerking movements during the night/early morning. I am due to go into hospital for a 48h fasting session as they want to see if it produces a hyperglycemic seizure, I guess this will point to insulinoma. Do the symptoms I have described (briefly) sound like classic Insulinoma symptoms? I am talking to myself but the insulinoma is on the tail so that is good , but they found a gallstone and a tumor on an adrenal gland (I am haveing blood work done to see if it is hormone producing and if so that will come out when I have surgery also. Tomorrow I meet with the surgeon to see how best to aproach this, guess it won’t be done laparoscopically, but we shall see. My husband has an insulinoma. We live in the upstate NY area (Albany). Can anyone recommend a surgeon near us, capable of performing this type of surgery? Where is everybody? I am getting a ct scan and ultrasound then next week meet with a surgeon. Here’s hoping we find the insulinoma easily! I had my 72 hr fast and it lasted 15 hrs at which time my bs went down to 32 and after the tubes of blood were drawn I was given glucagon whis as soon as it was injected in the iv caused me to feel like vomiting and or diarrea , then sweating and blurred vision. as the nurse was talking on the phone to the Edo she got a bolus(sp) and after checking bs which had risen to 107, started a fast infusion to bring me back. By blood pressure had dropped to about 64/32! I am not sure why . but I stayed the night in the hosp and still today have a headach and a neasous feeling. I will hear the results in a week or two. veryone was baffled my my reaction to the glucagon, any ideas? I have had low BS symptoms for @10 yrs for about 6 years I’d get the typical signs and eat and be fine but for the last years I have had less warning and when zoned out with all typical behaviorsbeen lucky to have family or co-worker around who knoew to get me to eat or drink juice or something and I “come Back ” within min. I work at a school and that is a great thing because the school nurse has recorded my BS at @ 20 when I am totally out of it . I have had, 2 yrs ago , a grand mal seizure and through testing the neurologist found no cause but has had me on Keppra . I feel great and work out and work and then out of the blue it happens again, reminding me that There is something going on inside. I have always felt everything that has happened is BS related. I found an endo who did bloodwork(normal) and is now arranging the 72 hr fast. I am looking forward to this and the results. By monitoring everything BS and food I eat there is no rhyme or reason to my episodes. I find my situation so like most everyone here. I have read all the comments and messages here and it is nice to know I am not alone..took me tons of searched on line to find you all! I have been in and out of hospitals for the past 2 years. They haven`t been able to work out what the problem has been. Looking back now – all the symptoms fits hypoglecemic. 6 months ago I was diagnosed with reactive hypoglycemic. However fasting blood sugar 4 mmoL/L. During the OGTT the blood sugar raised to 6.7 mmol/l – ( 3 hours into the test) c-Peptide app. 5000 pmol and insulin level around 600 pmol. On the 4 th hour the blood sugar dropped to 2.3 and c- peptide remained at 2700 pmol with an insulin level of 188 pmol. On the 5 th hour the figures never really changed. This test led to the 72 hour fasting test which for some reason have given some confusing results. My BG is never recorded lower than 3 mmol/L , however the insulin level stays during the 72 hour fast on average around 100 pmol with fluctuation beween 70 – 125 pmol. At the same time C- peptide stays on average on 1400 pmol with fluctuations between 800 – 1800 pmol. The proinsulin is on average 10- 15. So my question to you, has anyone experienced the same where the BG doesÂ´t go lower during a 72 hour fast ( however symptoms of hypoglecemic ) and at the same time with elevated insuline and c-peptide levels and yet been diagosed with an insulinoma? I’ve had similar experiences to many of the people on this page and am currently in the process of confirming whether I have an insulinoma. I just had an octreotide scan over the last two days and my endoscopic ultrasound is coming up soon. The surgeon I have been meeting with is already convinced that he will find the tumor. I plan to come back here and share my whole experience with everyone, since this page has been the most comforting and informative place on the internet when it comes to insulinomas. Right now, I was curious if anyone could give me an idea of what sort of bill I will be racking up. Would anyone be willing to share how much their surgery actually cost them? need help with a problem with my pancreas. i have seen 4 endocriologist one at mayo also with no luck. i am 25 and feel horrible all the time. i have just had and ercp which i am recovering from now. they can’t diagnose my problem. i used to have bs lows into the 30 and 40 im no only going into the 50 but i still feel horrible. I am 25yrs old and for the last 2 years have been very sick with pancreas problems. I have seen 4 endocriologist amoung 4 other different kinds of drs. I have even been to the may clinic and come home with no results. over the last two yeas i have had very low blood sugar running in the 40 and pretty much feeling horrible all the time. i had an ercp done before i went to mayo. so when i was up there they were only able to get my bs to drop to 59 after the 5 1/2 hr food test that i had done a month before and it dropped to 39 with high insulin levels. I have ran ever test there is to run and seen ever dr. there is to be seen and i still feel horrible. does anyone have any advice. i just finished having surgery and ercp for sluge in the gallbladder. they said it should make me feel better, but as for my pancreas they will have to wait for a spot to show up on a scan or until my bs go low again. Advice anyone Please!! That sounds like quite an ordeal you have been through. I hope your recovery continues to go well. I have not had surgery yet, primarily because it involves a large risk of ending up with a Whipples as well. I am still not sure what to do, and would really like to talk to you about this. Could you perhaps write to me? My email is nicolaiprl@gmail.com. That was quite a procedure you went through but it sounds like, all things considered, you have come through it about as well as one could. Keep getting better! I believe NET is a neuroendocrine tumor. Don’t know about M1B1. When I Google it I get proximity sensors, flame retardant fabric and a lot of complex math equations! Best of luck to you! Take care. I was operated on the 18th of August, the insulinoma unfortunately was not on the surface of the pancreas, it was about 8mm below the surface and close to all the vital ducts. The surgeon Dr Amit Patel attempted a laproscopic procedure but had to do a Whipples eventually. I was on the operating table for 12 hours, I remember being in a happy dream and then suddenly all of a sudden woosh they revived me, I felt so much pain, I screamed my gut out. I heard the doctors say the pain killers will take a couple of mins to kick in and that I had a low pain threshold, the pain did subside eventually and they put me in the high dependency ward, I was on a High dosage of painkillers administered via an epirdural. I just could not keep my eyes open and slept the first three days post op, I had drains both sides of the stomach, a catheter, another pipe going into my stomach through my nostrils to drain the fluids from my stomach, a pipe out of my neck, epidural sticking out of my back, I was quite a sight 🙂 the physiotherapist adviced it was important that I started moving about quickly else my lungs might catch an infection, he also thought me a couple of breathing excercies to keep my lungs active, but I was so sleepy I just could’nt do any of them, sure enough I had high fever a few days after the op, they put me on antibiotics at one time I was on paracetamol, tramadol, morphine through epidural + antibiotics + IV fluids, I felt very drained. They moved me to a general ward 4 days after the OP and they kept monitoring me,I started taking fluids orally a week after the op, they gave me fruit juices and some energy drinks, I had no appetite for anything at all, I would finish a small bottle of juice in three sittings, they removed all the tubes and drains in the second week but I developed a leak in one part of the surgical wound, I have a 20cm scar just below my chest btw, they swabbed it and said it was not an infection and thought it was some residual liquid coming out through the nearest available opening as they’d remvoed the drains, I was in the hospital for more than two weeks, I must say I recieved excellent care, Kings college hospital has excellent infection control measures, they change glove, aprons everytime they meet u, take blood samples on a daily basis to check for infection and any other unusual activity, they have an excellent food menu with a lot of choices, they even arranged an ambulance to take me back to Brighton. I was seen by the district nurses for two weeks post op, the leaks did’nt stop, I had blisters etc they took even more swabs, but the results were negative for infection, the leaks eventually stopped, it’s two and half months now post op and I’ve only just started work, it’s been a long recovery, I still can’t sit up for long, so the train journey from Brighton to London is a challenge, I still have some vague symptoms, like headaches, stomach aches etc, the doctors have said it’ll settle over time, I can’t say my life’s changed dramatically post op, I feel a bit depressed, my GP said this was normal following a major op, he said recovery following whipples might be as long as 6 months. I hoping the situtation improves over time and I’ll be back to my best. The result of the biopsy said “All features suggest a benign pancreatic NET (M1B1 not yet available, does anyone know what this is ??). I have been passed back to the Brighton Hospital for a long term followup, but I’ve not had an appointment with them yet ? For people who’ve gone through Whipples, do you have repeat scans every year, what happens here on ? Just thought I would update news on Mike. In late August he had a check-up with a Gastro-Enterologist here in town and they wanted to do a colonoscopy and an endoscopic ultrasound since he was over 50 and had a bit of a history – that little insulinoma thing, last year. You know, the baseline thing. Well, much to everyone’s happiness, the EUS confirmed that his pancreas and the rest of his upper GI tract is 100% OK! As well, the colonoscopy was clear. So he is cured, no more excuses or questions, CURED! I almost think this surgeon just wanted a chance to have a look at a pancreas after this rare type of surgery – although he said he was just feeling he needed to check that all was well. Hope everyone is doing ok and making progress in their own cases – haven’t seen any postings in a while. That doesn’t sound like it has been much fun. Some people are prone to developing scar tissue after surgery – I know as I am very good at it. I have had many problems with my reproductive system and every surgery – small or big has had serious scar tissue developing afterward, which made things worse. I just had my ovaries removed last March as the left one was attached to my Colon with scar tissue along with big cysts. The pain is not imaginable and i am very relieved right now. While my surgeon said he got everything out, he expects it may redevelop over time. He told me it is common in some people to form a lot of scar tissue after every surgery. It sounds to me you have enough problems with the bile duct and are very glad your pancreas is still functioning! It seems to me that everyone who has an insulinoma has a slightly different experience, but it is rarely easy and often life-changing even when everything goes well. You may be right – maybe I was lucky and only had a partial Whipple. They removed “only” the head of the pancreas, gallbladder, duodenum and about half of my stomach. My bile duct is now attached to my intestine like my stomach and pancreas are. And there’s where the still ongoing complications kick in. I’ve always had a problem with scar tissue (is this the correct term for when you get ugly big scars whenever operated on?) and I now have the same problem where my bile duct is attached til my intestine – is closes because of scar tissue. I started only 4 month after my Whipple having gallstone attacks and they got more and more often. 10 months after the operation I got jaundice because my bile duct was completely blocked with scar tissue – nad I had to have several operations to fix this 1. one the day before x-mas 2009. And already in april 2010 I started having these attacks again. New operation this may – which did not succeed – so they will try again next week. The procedure is in Denmark reffered to as a PTC – I dont know the english term. But this is the only ongoing complications – all the other was primarily in the first 2 months after the Whipple – while I was still in hospital. I am 41 years old – and the hospital keeps referring to me as “young” – so maybe this is why I have haf absolutely no special exams unless I have taken the initiative myself. So maybe Mike should consider himself lucky that your doctors are so proactive. Heidi is quite correct with the Whipple procedure only the Pancreatic head the Bile Duct the Gallbladder and the Duodenum are removed, in some cases a portion of the stomach may also be resected. The Duodenum is resected because it shares a blood supply with the head of the Pancreas. The Pancreas and Hepatic Duct are attched to the Jejunum to allow flow of Panceatic secreations and bile to flow into the digestive system. If part of the Stomach is removed it too is attached to the Jejunum. Patients who are not Diabetic before the procedure are not normally Diabetic post procedure. I have seen this done on many occasions although still a major operation with a significant risk of complications, it no longer has the high morbidity rate once associated with this procedure, especially in non-malignant tumours.But as ever choose your surgeon wisely my friends. Our pancreatic surgeon told us that a full Whipple included the pancreas, gall bladder and spleen and caused instant diabetes. So maybe the terminology used is a bit different around the world. To my mind, your operation would be classified as a partial because you were able to retain pancreatic function with that procedure. I would say that you had a very good surgeon if he was able to remove the head and re-attach the remainder to your intestine (duodenum). Never the less, these are hard surgeries to be subjected to and retaining pancreatic function is the mark of success. I am curious what your post surgery complications are as you mention you continue to deal with some. Although my husband Mike has no remaining problems that we know of, now that he has had this ‘little’ problem, our medical people continue to treat him with care. He has recently undergone a series of eye exams because of his insulinoma. The practitioner wanted confirmation that there was no lasting damage to his retinas with this condition. (there wasn’t) Our GP has referred him for another upper GI scope and a colonoscopy to rule out anything and develop a ‘baseline’. Of course Mike is now 51 and at that age where men start to have health problems, so they are being proactive since they have him in their grasp now. This for a man who hadn’t seen the GP for 7 years before his collapse. He feels like an rat in an experimental lab now. I keep telling him that being ‘interesting’ brings attention. But better a bit too much than none at all. Hi – just a quick comment here – as my english is not perfect – I am danish and can understand all you write – but my written english lacks a bit in all the medical terms. But I can’t sit still and read that Heidi and Tatia says that a full Whipple operation means that you become a type 1 diabetic. This is not true. I had a whipple operation january 2009 and even though my tumor was in the head of the pancreas the only removed about 1/3 of my pancreas – and attached the remaining part to my small intestine (is this the right word???). And my bloodsugar levels are perfect now and I am not a diabetic. Lots of other complications that I shall not mention here – but I just wanted to say that if you get the Whipple done by a competent surgeon, you may still keep some of you pancreas. I had a open surgery done in april 2008 whtich removed only the tumor – but 3 months later it was back – therefore the Whipple last year. So if I had known then what I know now I would have preffered the Whipple at the first time. Best of luck to all of you who still have the operations ahead – and believe me: despite all the complications I have had – and still have – its worth it. Tatia and Gil are very right. Whipple is the worst case scenario and will make you a permanent Type 1 diabetic as the pancreas would be removed entirely. It may be ‘comforting’ to know a surgeon has done many of them, but that really shouldn’t be the measurement of success in this case. You want a surgeon who has done insulinoma surgery and looks for the most conservative approach in his plan. Tumours on the tail of the pancreas often can be removed with a laproscopic procedure. If it is located higher up or on the head (where the pancreas connects with the duodenum) the procedure is much more likely to be an open one. However, our surgeon advised us that he aimed to avoid the dreaded whipple at all costs because of the side effects and complications. He was a liver, gall bladder, and pancreas tumour specialist and only worked on those problems, so I respect his opinion. Since your tumour appears to be on the head, the deciding factor is how close it is to the pancreatic duct. Mike’s was on the head, about the same size as yours and just a hair width away from the duct, but his didn’t end being a whipple (although we were told it was always a possibility if things didn’t go well), so do discuss your concerns with the surgeon. You have the right and the choice to decide who operates on you. A Whipple is a much more extensive surgery and seems unneccesary in your case. I too looked at a great Dr at John Hopkins who was known for the Whipple and done more Whipple procedures than anyone in the U.S. My husband said no because it sounds like he really likes to do this procedure not always the procedure that is needed. He is a great doctor but I did not need the whipple. For a surgeon to go in and operate on someone without knowing where to go in this day in age is not good. If the other surgeon found the insulinoma and you preferred him by all means use him. The Whipple is much more complicated and I believe will make you a Type I diabetic. This is your life and your body and you have to be totally comfortable with who you choose to operate on it. I know you are beaten down right now but you need to continue to be strong for a little longer and then this whole mess will be over with and you will have your life back, new and improved! Hang in there, will be thinking of you and waiting to here what happens. Hi Rudy – I presume you are in the UK. The new government have said that they are bringing in choice of consultant led team – which will mean you can choose the consultant you are under – this doesnt necessarily mean the consultant personally of course. they have also said “no decision about me without me” relating to NHS care. Pals is a good place to start but I think you can say that you want to be operated on by Dr S – and this is what you should do. Dont accept a whipple as anything but a last resort – like you I dont like how he is talking. We do have to remember that sometimes surgeons have procedures that they like doing – easy when you dont have to live with the consequences! be strong and stand up for what you want. i work in the NHS and if you want to contact me offline that would be ok but I dont know how to do that! I’d been to Kings yesterday to meet the new surgeon, it turns out that he is a general surgeon and not an endochrine surgeon, the first thing he said was he was going to do a whipples if he could’nt spot the tumor. He said it was a high risk major operation with chances of complications, he said he had done hundreds of whipples, I felt he was inclined to doing this procedure. This is stark contrast to when I met Dr Schultee who ruled out Whipples straight away, he said they could see the tumor and said I’d only go through what he called a minor op, he said whipple’s would only be done in very bad cases where the tumor was not accessible and my case did’nt warrant a whipple’s. Apologies for not getting back sooner. Klaus-Martin Schulte is an endocrine surgeon and has vast experience in removing Insulinomas. Everything that he said would happen to me biologically post op has happened. I would trust my life to this surgeon (in fact I did). The care at Kings College was excellent (the food wasn’t great tho) and the nurses were full of positive attitude as well as being friendly and attentive. Hi Sue – thanks for that, Ive had a look and its interesting. Im hopeful that the endocrinologist will get to the bottom of this, he seems very thorough but part of the difficulty seems to be getting them to think about this as a possible diagnosis as its rare. Im really fed up because I went through this same sort of situation a few years ago getting the doctor to realise that I did have an underactive thyroid, despite my bloods being ‘normal’! Id just like something straightforward and easy to diagnose – if I have to have something of course! Someone brought kiddy sweets into work a couple of days ago and I had some – I felt so much better although my bloods werent very low so Ive been eating them in the mornings – didnt stop the main dip I get at lunchtime but did clear my head – anyone else had this? My memory is still poor – how bad can memory get and still get better after surgery? I am thinking that my brain has been damaged by this as I cant see how it will get better – the foggy brain cleared with the sweets but not the poor memory – any thoughts anyone? I am kind of in the same boat. I have hypoglycemia, mostly in the mornings, that makes me eat every 1 1/2 to 2 hours. My lowest readings have been in the lower 40s. I went through the 72-hour fast, but did not go below 62. I have since read that a rare percentage of insulinoma patients do not go low fasting , but do react to glucose intake. When I had my GTT, we had to stop at 3 1/2 hours, as i was having all of my adrenaline symptoms. At 3 hours my glucose had been at 52, so i presume I was in the 40s by symptom-time. They did not take any more labs(small town lab). Hi Nicolai, thanks for your reply and help. I will see what the endocrinologist has to say in a couple of weeks. on the GTT it was 3.2 and they stopped it after 4 hours because of my symptoms – blue hands, brain not working properly and nearly passing out – they will have done this as a serum level now and did take cpeptide at the lowest point, not sure if they did insulin or anything else as well as I really wasnt ‘with it’. Wouldnt this tell them anything without me having to have the 72 hour fast? I cant find out the difference between a reactive hypoglycaemia and insulinoma – if anyone has any other sites or resources to recommend Id be grateful. You need to have a 72-hour test. That is the only way to diagnose an insulinoma. They should monitor your blood sugar regularly and when it drops to 2.0 – 2.5 (the lower limit varies between hospitals) they need to take tests for glucose, insulin, c-peptid and preferably proinsulin. From these values you can see if it is an insulinoma. If your blood sugar does not drop that low during 72 hours it is highly unlikely that it is an insulinoma. When they take all the blood test at the end of a 72-hour test the glucose should be measured by drawing blood (called a plasma glucose test) and not using a normal diabetes monitor (as you mentioned yourself these are not accurate when it comes to very low values). Hope you are able to get some good doctors to help you. You continued to have symptoms after your initial surgery?? Seems they may not have removed all the insulinoma(s). Have they done a CT or MRI recently? So sorry you’ve had to go through it for so long. I would go for long periods of time without my sugar getting too low. but after a while it got lower. How long have you suffered with the disease? What happens if you don’t eat when you know you need to? If your’e healthy, your system will kick in to raise your sugar. I would push for that 72 hour test. I understand the weight issue, although doctors told me I was unique in the fact that I never gained as much weight as the average insulinomiac. Instead of eating meals, I would drink a milk substitute like soy or rice milk, whenever I felt I may be getting low. Usually that would suffice until I could eat a complex carb meal. I know it’s not the same for everyone. And there’s no easy answers. This IS, definitely, a life altering disease! hello Pat – I know from reading the posts here and on Enola Wright’s site that some people have had an insulinoma removed and then were found to have another – this happened to Enola I think. My understanding is that hyperinsulinaemia is a description – they still have to find the cause – dont be fobbed off. I had an insulinoma removed from the tailend of my pancreas 16 years ago and since then I have had repeated symptoms of hypo’s and anxiety. Has anyone else had any problems since their operations because Iam really fed up now? I had an insulinoma removed 16 years ago after suffering hypo’s and anxiety for 15 years before diagnosis. My question is, has anyone had the operation for insulinoma and still suffer with hypo’s and anxiety? My symptoms started a few months after my op and i have really struggled to get well since. I am now back under the care of the QE (England) and i had a 72 hour fast in 2009 but an insulinoma was not diagnosed and Dr’s seems to think it is hyperinsulinemia. Oh my Tatia! I have always been curious about being able to be insured. I no longer have health or life insurance, because we can’t afford it. But I assume I couldn’t get health insurance anyway, if you couldn’t get life insurance… even though I’ve been completely cured over two years ago! This just shows how little they know about insulinomas…still, 18 years since I was originally diagnosed. Wow Gill, I hope you can find a doctor who will give you the attention you need! I have to say that I have experienced all of your symtoms, except the hypothyroid and high blood pressure. I wouldn’t say that they all, including your low sugar symptoms, couldn’t be a sign of one particular problem…but I would ask which of these issues are the most life altering. I would assume that you’ ve had a urine test to rule out a kidney infection. The dizziness I felt that was different from my hypo dizziness, turned out to be a sinus issue that took quite a while to correct. The burning feet and restless leg (both which have been reduced since I started taking supplements, especially magnesium, cut out dairy and chocolate and drinking more water)) were not related to my insulinoma. But the head and neck jerking, hungry, dizzy, spacey poor memory difficulty thinking thing was all low sugar. The GTT test wouldn’t help, you’d need a 72 hour fast. If I were you I’d get a glucose monitor and start keeping a diary. If you can, I’d let a better doctor know (I had to go through dozens!) how severe it was and see if they could prescribe some strips so you can test your own blood sugar levels. Be safe! Good luck! I am curious if any of you have tried to get life insurance after being diagnosed with an insulinoma? I just recently tried and was denied due to history of insulinoma. The reason being I need to wait 5-7 yrs before being eligible. It is almost like having a cancer and trying to get life insurance. I am 18 months post insulinoma and am feeling great. My latest scans indicated everything was great. I am at a loss now as to why I would not be eligible for life insurance after having the insulinoma removed. Am I crazy for thinking I should be eligible? If any of you have had a similar experience please share and/or how you went about getting life insurance or not after having the insulinoma removed. hi all – Im having a variety of tests for symptoms including hypoglycaemia, dizziness, memory/concentration problems – sometimes I feel as though Ive been mesmerised! starey, spacey and just cant think properly or remember things. I had a 6 hour GTT which had to be abandoned at 4 hours because my hands went blue and I was about to pass out, (but the blood glucose didnt go that low at 3.4) so I have some sort of reactive hypoglycaemia. Im now thinking this may be insulinoma so rather than just worrying I thought I would ask you folks what you think? Ive had loads of blood tests for almost everything standard and all normal. My other symptoms are burning feet, pain felt in kidney areas and also to right side somewhere. Im overweight because I cant diet as I get so hungry and dizzy but Ive also got a dizziness that seems different to the hypoglycamia dizzy, more vertigo-like and Ive got swollen ankles and a restless leg symptom in one calf. Ive had some strange movement of my neck/head occasionally (for years) and think this is when glucose is low. Im hypothyroid and my BP is raised. Im still working full time so not desperately ill or anything but the memory difficulty is now a real problem. Ive had a head scan and having a synacthen test next week. I feel that I have been fobbed off by my GP for years when Ive known something has been wrong and at least the endocrinologist is listening but the better informed I am the less they can fob me off! Im really fed up but not a depressive or hypochondriac! I will really be grateful for your thoughts and wish you all the very best with your own health challenges. I echo the advice of the other posters – you NEED a pancreatic surgery specialist. We had to travel 800 km (500 miles) to get to one, but we ended up with Western Canada’s premier hepato-biliary doctor. Mike also had his tumour on the head and that is the most delicate area to work on and avoid the dreaded Whipple. Our surgeon only worked on tumours of the pancreas, liver and gall bladder, so we were in good hands, however, Mike did have serious post-op complications and ended up in hospital for a total of 7 weeks and a drain in his belly for 4 months. Although we have good general surgeons here in our smaller city – we were told we needed to be in the big city hospital with the best specialist in our province. In my experience you and your family need to be very strong advocates throughout the experience. I did this for my husband and I fought the system the whole way because insulinoma is too unknown to the general medical world, never mind the general population. We ran into problems getting through the testing process, admission to hospital, coming home and re-admission to hospital due to complications. Most doctors said “oh, I think I’ve heard about that” when confronted with Mike’s insulinoma diagnosis. That is not an inspiring statement, by any means! So keep asking or demanding to get to an experienced surgeon – you need to. It is crucial that someone with experience operates on you. Maybe that is why they are reluctant to do it at King’s. Maybe it is the funding………………. I know when I went to the QE they were quick and efficent. I did not have a Whipple although they warned me that, depending on what was found, they couldn’t guarantee it. I believe Mr Mirza still is at the QE. The address is: Queen Elizabeth Hospital, Edgbaston, Birmingham, B15 2TH. Phone number 0121 472 1311. I THINK the phone number of the department is: 0121 627 1627. Anyway ask to speak to Mr Mirza’s secretary and explain the situation to her/him. They may be able to tell you how to access him doing the operation if that is what you want. My guess is that you will have to be referred by your GP or the hospital. I was referred by the local hospital because the first thing they said to me when they discovered the insulinoma was that no one there could do it! Good luck. In my opinion you absolutely need to have you surgery done by a special surgeon who knows the pancreas like the back of their hand. The pancreas is a very cantankerous organ. You never know what will happen. And yes you need to know exactly where the insulinoma is before operating. The better trained surgeon will make all the difference in the world. It could save you from having a whipple procedure done and eliminate the prospect of becoming a diabetic. Please use the best surgeon you possibly can that has much experience with this type of procedure. I had my surgery done by Mr Mirza at the Queen Elizabeth Hospital in Birmingham, England 3 years ago. When asked he had told me he had done 4 insulinoms in the previous 12 months but 100s of other types of operation. No one will operate on you until they find the location of the tumour which, evasive little devil that it is, does take some doing. Contact him; I found him very approachable and put my trust in him. And I’m still fine and enjoying life. I am just being passed around, I have now been asked to speak to the secretary of a surgeon who specialises in gastric bands ? I am not sure what I’ll do next, can I insist on Dr Schultee doing my operation ? I remember him saying the sucess of insulinoma surgeries depended on the experience of the surgeon ? he assured me by saying he had done hundred’s of such surgeries and that I was in safe hands ? Richard, what was your experience at Kings ? I assume you were operated by Dr Schultee ? Now I have a specific question. My immediate health issues(not the hypo part) is that I have POTS, or postural orthostatic tachycardia syndrome that began 4 years ago. I get lightheaded and my heart races when I stand longer than a few minutes. It is VERY life-limiting, as I can’t go do shopping or anything I used to do. In researching about hyperinsulinemia, I came across some medical literature about insulin causing vasodilation in the body. Most of us with POTS have vasodilation, and then when we stand, the blood “pools” in the extremities. Then the brain doesn’t get enough blood and the adrenaline kicks in, causing us to get heart rates of up to 160 in some people. My question is, with all the insulin that y’all had, did you notice that you were lightheaded when standing at all?? Did you notice that you were heat intolerant at all??? I am just trying to find out if I can correlate high insulin levels(chronically, for years) with the body getting orthostatic issues. I have found out that some of us POTS people have had “reactive hypoglycemia” for as much as 20 years. Our glucose drops into the 30s, and that just isn’t normal. I’m hoping to talk to my endo to see if she can tie my chronic hypos together with my POTS. Thanks for any feedback! Thanks all who talked about their symptoms. I find that I also get the shakes first thing, and then I get really, really hot, then anxious. I never let it pass that stage to see how low I go or anything. I do notice that my mind “fixates” on getting something sweet. Nobody can talk to me, as I ignore everything else except getting my sugar “fix”. When I have a hypo intially I feel light headed and my hands start to shake I start to shake and I have tingling of the lips. Next I become confused if someone asks me a question I have to concentrate really hard to formulate some sort of answer and even then my speech is stuttering and dis-jointed. I’ve never actually passed out but have come close. It’s a horrible feeling and unlike anything else I’ve experienced, luckily now I’m stable on Diazoxide 300mg but have had no luck locating the little beast. I’m now awaiting referral to Prof. Meeran in London. Just been catching up on whats been going on with everyone. Great to hear so many wonderful success stories and a few concerning ones. This site truely is a godsend, people need to lean on others who understand where they’re coming from.This condition has to be experienced to be believed, only we and those close to us can see what it does to our everyday lives. Now it seems its my husbands turn, he has been diagnosed with a rare squamous odontogenic tumour of the jaw, we are special getting all the rare stuff! We’ll be in Melbourne having that dealt with next month. He’s never relly been sick so at least I can give him all the ins and outs of hospital life. I noticed there’s been another Australian pop up recently, it seems we’re rarer than most with our low population, if only more of us could find this site. Hope you’re doing well Mel if you would like to get in contact let me know and I’ll organise an email ok.
Well here I am, 2 and a half years post op from having my insulinoma removed at Kings College in London. I guess this is more for those about to undergoe an op. I was told by my surgeon that my life would start to change after about 3 months from surgery. He was spot on. My confidence was boosted beyond my wildest imagination. My ability to remember things improved a hundred fold. I can’t remember the last time I had a cold. In short, I’m a completely different person from the one I was 3 years ago. I went thru hell to get here and I really feel for those diagnosed with this horrible tumor but please be assured, the life you get post op is everything you want it to be. I still wake up almost euphoric every morning that I’ve got another day on this wonderful planet. Thanks also to this site for all the info and support I was given. I actually have MEN1 myself with malignant Insulinoma. I had a whipple surgery in Jan. of 08 at U. of Iowa, and a Total parathroidectomy at UCLA last year for my Hyperparathyroidism. I also have a pituitary micro-adenoma but it is non functioning, so we are just watching it. you are correct that Lipoma’s and Insulinomas can both be a part of MEN1. have they checked your PTH and Calcium levels? The Parathyroid issues are sometimes the tell all if you have one of the other Endocrine issues. i was told that if you have two of them, (pancreas, pituitary or parathyroid, and in some cases the angiofibromas/lipomas etc) that they consider that a “clinical” diagnosis for MEN1. i actually had genetic testing done and they were able to find the mutation to confirm the clinical diagnosis for me. have your docs said anything about the possibility of MEN1? I would ask them if they think it is something to look into. good luck!! When I had low sugar I was very confused. Had you asked me what is 1 plus 1, it would have been hard for me to give you an answer. I spent a lot of time just staring strait ahead. When driving it was awful, it was very hard to stay in my lane and very hard to see for some reason. I had other times where I felt very faint and one time almost went over a railing while holding my infant. It got to a point where I did not trust myself to be alone with my kids, it was that bad. What were your physical symptoms when it “hit” you? What did your body do? I know I’ve read it in many places, but it doesn’t compare to when you hear it first-hand. I am not real familiar with salivary results, so I wouldn’t know anything.